Robinson and his wife, Heidy, reside in Hurst, Texas, with their son, David...Was signed by the Cubs as a 16-year-old nondrafted free agent out of Venezuela on July 2, 2000...signed by Cubs scout Hector Ortega...Was named the 2014 Richard Durrett Hardest Working Man recipient, as voted on by the DallasFort Worth Chapter of the BBWAA...Played for Venezuela in the 2017 World Baseball Classic, batting .214 (3x14) with two RBI in six games...IN THE COMMUNITY: Was extremely active in the community during his time with the Rangers, winning the team's Jim Sundberg Community Award in 2016...started the Robinson Chirinos Foundation in 2016, which aims to benefit the youth and families in our communities...Was originally added to the Cubs 40-man roster on Oct. 29, 2010...was then part of the eight-player trade in 2011 that sent RHP Chris Archer to the Rays and RHP Matt Garza to the Cubs...Signed a one-year contract with the Astros as a free agent on Dec. 6, 2018. Set career highs in homers (18), games (113), runs (48), hits (80), RBI (65) and walks (45)...led AL catchers in OPS (.768), OBP (.342) and RBI (62)...led Rangers backstops in starts for the fifth-consecutive season (102)... finished tied for second among AL catchers in homers and tied for fourth among MLB catchers...ranked second in the AL in hit by pitches (19), which matched a Rangers franchise record set by Carlos Gomez in 2017...batted .322 (29x90) with a 1.022 OPS with runners in scoring position...made his fifth-consecutive Opening Day roster... served a one-game suspension on June 15...recorded his fifth-career multi-homer game on April 28 at TOR... homered on his 34th birthday on June 5 vs. OAK...hit his 61st home run as a catcher with the Rangers on July 25 vs. OAK, moving into second place on the club's all-time home run list by a catcher, behind only Pudge Rodriguez (212). Set career highs in all 4 slash categories (.255/.360/.506/.866) as well as home runs (17), runs (46), XBH (31), total bases (133), walks (34), and HBP (10)…hit .320 in 9 games in April, then batted .186 (24-129) in 42 G from the start of May through 8/6…from 8/8-9/16, reached safely in a career-high 29 straight games (.381/.523/.679/1.202), T7th-longest streak in MLB in 2017 and best by a Ranger since 2012 (Andrus-32 G, 4/9-5/14/12)…posted career-best 14-game hit streak from 8/14-9/1, longest by a Texas catcher since Ivan Rodriguez in 1999 (20 G)…over final 8 games, hit .120 (3-25) to drop final average from .269 to .255…played final 5 weeks of season with a left hamstring strain first suffered during a late August series in Anaheim, an injury which severely limited his ability to run…a late September MRI found a Grade 2 strain, and Chirinos did not play in the club's final 5 games after being eliminated from postseason contention on Sept. 26…played for Venezuela in 2017 World Baseball Classic…had a pair of starts at DH, his first-ever starts at that spot. HOME RUNS // Established a career high with 17 long balls in 2017…averaged a home run every 15.47 at-bats, 14thhighest rate in the A.L….his 16 home runs as a catcher were the 2nd-most by a Texas backstop since 2006 (Mike Napoli with 19 in 2011)…hit home runs in career-high 4 straight from 6/22-28…12 of 17 HR were solo shots…hit game-tying or goahead HR in 8th-or-later in consecutive starts 6/7 vs. NYM and 6/10 at WAS…his tie-breaking 3-R HR in the 11th on 6/10 was Rangers' 1st extra-inning HR of 3-or-4 runs since 7/30/13 vs. LAA (Leonys Martin), and 1st road instance since 5/5/12 at CLE (Adrian Beltre)…final HR on 9/10 vs. NYY was 50th of his career. FIELDING // Started 80 games behind the plate, most since a career-high 88 games in 2014…team went 41-39 in starts behind the plate…caught 8 of 54 (14.8%) of runners attempting to steal, 2nd-lowest pct. among qualifying A.L. catchers (HOU's Brian McCann, 11.5%, 7 of 61)…caught 3 of the final 5 runners attempting to steal after a span in which he nabbed one of 26 attempted base stealers from 7/4-9/14, as opponents were successful in 15 straight attempts from 8/16-9/14. Opened the season as the club's starting catcher, but endured a lengthy disabled list stint after sustaining a fractured right forearm when he was hit by a pitch in the 6th game of the season…hit .267 (4-15) with a HR and 2 RBI in 5 games/starts for Texas before his disabled list stint, starting 5 of the team's first 6 games…returned from the disabled list on 6/9 and started 27 of the club's next 45 games through 7/31, batting .180 (16- 89) with 7 HR and 15 RBI…10 of 16 hits in that span went for extra-bases (3 2B, 7 HR)…was the club's backup catcher after the acquisition of Jonathan Lucroy on 8/1, starting 14 of the club's final 56 games…matched career high with 3 hits on 9/3 vs. HOU…batted .342 (13-38) with 6 2B, a HR, and 2 RBI over final 15 G/12 GS…14 of last 23 hits went for extra-bases (9 2B, 5 HR)…had 20 extra-base hits (11 2B, 9 HR) and 13 singles in 2016, the fewest singles ever in a season by a Ranger with 20+ XBH…hit .361 (13-36) with no outs/bases empty, .180 (20-111) in all other at-bats. Rangers' Opening Day catcher was limited to 78 games after he was hampered by a shoulder injury for the majority of August and September…team-high 73 starts behind the plate…established career highs in doubles (16) and walks (28)…ranked among team leaders (minimum 250 PA's) in PA/BB (third, 9.75)and AB/RBI (fifth, 6.85)…posted six go-ahead RBI and four game-winning RBI, including Rangers' lone walk-off HR in 2015 (June 16 vs. Los Angeles Dodgers). Started 88 games at catcher with a total of 91 appearances behind the plate, the 3rd most games for a Texas backstop since 2009...ranked among team leaders in home runs (T2nd, 13), doubles (5th, 15), and RBI (T5th, 40), and had 4th-highest OPS (.705) among Rangers with 300+ plate appearances (Beltre-.880, Choo-.714, Rios-.709). Spent spring training with Tampa Bay but was designated for assignment on March 31 when the Rays set their Opening Day roster … acquired by Texas on April 8 in exchange for cash considerations, the first major league trade between the at first base, and 11 at DH … hit .279 (19-68) with 7 extra-base hits (3 2B, 3B, 3 HR) vs. southpaws and .249 (49-197) with 13 extra-base hits (7 2B, 3B, 5 HR) vs. right-handers … batted .350 (21-60) with RISP…hit .290 (47-162) before the All-Star break and .204 (21-103) afterwards … hit .222 (41-185) as a catcher but .338 (27-80) when not behind the plate … reached safely in 60 of 74 contests…hit safely in 19 of 23 games before his first recall at .295 (23-78) with 5 doubles, 2 home runs, 14 RBI, and 11 runs scored…compiled a season-best 9-game hitting streak (.323, 10-31) from April 20-29…logged his only 2 triples of the season in the same game, May 3 vs. Nashville…had 4 straight 2-hit games (.471, 8-17) during a 4-game series at Iowa, June 6-9… had a season-high 4 RBI on Aug. 19 at Nashville…posted a .984 fielding pct. overall (7 E/428 TC)…caught 15 of 59 attempted base stealers (25.4 percent). Missed the entire 2012 season due to a concussionhe suffered during Spring Training when a foul tip struck his mask...spent the year at the Rays spring training complex in Port Charlotte, Fla., rehabbing and undergoing daily vision therapy...Played for Navegantes del Magallanes in the Venezuelan Winter League...went 3-for-19 (.158) with four BB in six games. Rookie catcher split the season between the Rays and Triple-A Durham...appeared in 20 games for the Rays, including 15 starts at catcher, his first major league experience...recalled on July 18 to replace Jose Lobaton who was placed on the 15-day DL...optioned to Durham on Aug 19 when John Jaso was activated from the DL...Made his major league debut on July 18 vs. NYY, the day he was recalled, and doubled off A.J. Burnett in his first at-bat...was the 6th in Rays history to record an extra-base hit in his first plate appearance...Hit his first career home run in a 9-1 win on Aug. 3 vs. TOR, a 3-run blast off Carlos Villanueva, for his first career RBI...collected a career-high 4 RBI and reached base a careerhigh 4 times, going 2-for-2 with 2 walks...6 of his 7 RBI came in a span of 2 games, Aug 3-4 vs. TOR...On Aug 4 vs. TOR, hit a game-tying RBI single in the 11th inning and a walk-off RBI single in the 12th off Shawn Camp...according to Elias, he became the first rookie with separate gametying and game-winning RBI, both in extra innings, since ATL Nick Green on July 2, 2004 vs. BOS...Recorded his first career multi-hit game on July 27 at OAK in his only game at 1B since 2009 with Double-A Tennessee (Cubs)...Caught only 2 of 23 attempted base stealers (8.7 percent)...on Aug 6 vs. OAK allowed 7 SB in 7 attempts, the most steals allowed in Rays history...the previous high was 5 (6 times, last on June 1 vs. TEX)...it was the most steals in a game for the A's since they had 8 on July 29, 1989 vs. SEA, including 5 by Rickey Henderson...Hit .259 (73-for-282) in 78 games for Durham...had a .176 (12-for-68) avg. with 0 HR and 2 RBI in 17 games in April...from May 1 through season's end, batted .285 (61-for-214) with 6 HR and 22 RBI in 61 games...batted .312 (24-for-77) vs. LHP, compared to .239 (49-for-205) vs. RHP...Caught 17 of 63 attempted base stealers (26.9 percent), his lowest mark since converting to catcher in 2009...In spring training hit .429 (9-for-21) with 2 HR, 8 RBI, 2 doubles and a triple in 9 games. Completed his 10th and final season in the Cubs organization...spent the majority of the season at Double-A Tennessee and advanced to Triple-A Iowa for the first time...Set career highs in nearly every offensive category, batting a combined .326 (104-for-319) with 18 HR, 74 RBI, 28 doubles, a .416 OBP, .583 SLG and .999 OPS in 92 games...His .999 OPS ranked 8th among all minor leaguers and led all minor league catchers...ranked 3rd in the Cubs system in batting avg...Was the starting catcher in the Southern League All-Star Game for the North Division...was also named to the league's postseason All-Star Team...Combining both stops, hit .438 (46-for-105) with 9 HR against left-handed pitching...hit .388 (33-for-85) with 8 HR in Double-A and .650 (13-for-20) with 1 HR in Triple-A...hit .271 (58-for-214) with 9 HR vs. righthanders...Drew more walks (44) than strikeouts (33)...Was named the Best Defensive Catcher in the Cubs system by Baseball America prior to the trade...threw out 28 of 88 base runners attempting to steal (31.8 percent)...Was a non-roster invite to Cubs spring training... placed on the DL from May 25-June 3 due to a concussion...promoted to Iowa on Sep 7 before returning to Tennessee for its postseason run...added to Chicago's 40-man roster on Oct 29...Played winter ball in Venezuela for Navegantes del Magallanes. Robinson set a number of career highs in his first season as a catcher...batted .294 (77-for-262) with 11 homers and 52 RBI in 81 games between Single-A Daytona and Double-A Tennessee...Hit at a .300 (68-for-227) clip with 35 walks, 13 doubles, 11 homers, 47 RBI and a .946 OPS in 69 games with the D-Cubs...led Daytona in homers and RBI...Was named to the Florida State League Post-Season All-Star team...In his first season as a catcher, threw out 20 of 75 runners attempting to steal with Daytona...Had a .322 batting average against southpaws with Daytona, going 19-for-59...he posted a white-hot .372 batting average (16-for-43) with 15 RBI in just 12 May contests with the D-Cubs...On May 31, belted two grand slams in an 11-3 victory over Sarasota...the two slams tied the league record held by St. Petersburg's Charles Reidell, who accomplished the feat in 1959...Earned a promotion to Double-A Tennessee August 4...in 12 games with the Smokies, went 9-for-35 (.257) with seven walks, three doubles and five RBI. Split the season between Rookie-League Mesa, Single-A Daytona and Double-A Tennessee, batting a combined .275 (65-for-236) with 12 doubles, five homers and 29 RBI. Earned a late-season promotion to Double-A Tennessee after batting .259 in 79 games for Single-A Daytona. Hit at a .242 clip, while setting career highs in RBI (47) and games played (126) with Single-A Peoria. In his first season with Single-A Daytona, batted a then career-high .273 (63-for-231) in 74 contests. Saw action in 84 games with Single-A Lansing, posting a .241 average (77-for-319). In a then career-high 108 games, hit .232 (84-for-362) with Single-A Lansing. Batted .247 in Single-A Boise with 15 doubles, eight homers and 38 RBI. Appeared in 47 games with Rookie-League Mesa...batted .234 (36-for-154) with 12 doubles and a league-leading six sacrifice hits in his first professional season. 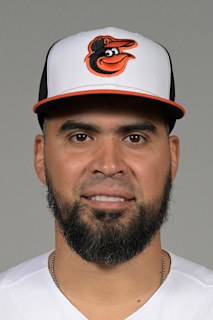 December 6, 2018 Houston Astros signed free agent C Robinson Chirinos. November 2, 2018 C Robinson Chirinos elected free agency. June 16, 2018 Texas Rangers activated C Robinson Chirinos. June 15, 2018 C Robinson Chirinos roster status changed by Texas Rangers. October 29, 2016 C Robinson Chirinos assigned to Navegantes del Magallanes. June 9, 2016 Texas Rangers activated C Robinson Chirinos from the 60-day disabled list. June 8, 2016 Texas Rangers sent C Robinson Chirinos on a rehab assignment to Frisco RoughRiders. June 5, 2016 Texas Rangers sent C Robinson Chirinos on a rehab assignment to Round Rock Express. May 31, 2016 Texas Rangers sent C Robinson Chirinos on a rehab assignment to Frisco RoughRiders. April 10, 2016 Texas Rangers placed C Robinson Chirinos on the 60-day disabled list. Fractured right forearm. September 7, 2015 Texas Rangers activated C Robinson Chirinos from the 15-day disabled list. September 1, 2015 Texas Rangers sent C Robinson Chirinos on a rehab assignment to Round Rock Express. August 1, 2015 Texas Rangers placed C Robinson Chirinos on the 15-day disabled list retroactive to July 31, 2015. Strained left shoulder. October 7, 2014 C Robinson Chirinos assigned to Navegantes del Magallanes. January 31, 2014 C Robinson Chirinos assigned to Venezuela. September 1, 2013 Texas Rangers recalled C Robinson Chirinos from Round Rock Express. July 18, 2013 Texas Rangers optioned Robinson Chirinos to Round Rock Express. June 18, 2013 Texas Rangers recalled Robinson Chirinos from Round Rock Express. May 21, 2013 Texas Rangers optioned Robinson Chirinos to Round Rock Express. May 10, 2013 Texas Rangers recalled Robinson Chirinos from Round Rock Express. April 8, 2013 Tampa Bay Rays traded C Robinson Chirinos to Texas Rangers. April 8, 2013 Texas Rangers optioned Robinson Chirinos to Round Rock Express. March 31, 2013 Tampa Bay Rays designated Robinson Chirinos for assignment. March 15, 2013 Tampa Bay Rays optioned Robinson Chirinos to Durham Bulls. November 1, 2012 Robinson Chirinos roster status changed by Tampa Bay Rays. October 11, 2012 C Robinson Chirinos assigned to Navegantes del Magallanes. April 19, 2012 Tampa Bay Rays transferred C Robinson Chirinos from the 15-day disabled list to the 60-day disabled list. April 4, 2012 Tampa Bay Rays placed C Robinson Chirinos on the 15-day disabled list retroactive to March 26, 2012. Concussion. October 1, 2011 Tampa Bay Rays activated C Robinson Chirinos. August 18, 2011 Tampa Bay Rays optioned Robinson Chirinos to Durham Bulls. July 18, 2011 Tampa Bay Rays recalled Robinson Chirinos from Durham Bulls. March 15, 2011 Tampa Bay Rays optioned Robinson Chirinos to Durham Bulls. October 29, 2010 Chicago Cubs selected the contract of Robinson Chirinos from Tennessee Smokies. September 9, 2010 Robinson Chirinos assigned to Tennessee Smokies from Iowa Cubs. August 12, 2010 Robinson Chirinos assigned to Iowa Cubs from Tennessee Smokies. June 3, 2010 Robinson Chirinos roster status changed by Tennessee Smokies. May 26, 2010 Tennessee Smokies placed C Robinson Chirinos on the 7-day disabled list retroactive to May 25, 2010. January 13, 2010 Chicago Cubs invited non-roster C Robinson Chirinos to spring training. October 7, 2009 C Robinson Chirinos assigned to Navegantes del Magallanes. August 4, 2009 C Robinson Chirinos assigned to Tennessee Smokies from Daytona Cubs. May 27, 2009 Robinson Chirinos roster status changed by Daytona Cubs. May 15, 2009 Daytona Cubs placed C Robinson Chirinos on the 7-day disabled list.